The Philippines is an archipelago of 7,107 islands located in Southeast Asia in the western Pacific Ocean, stretching from 3.5° N to 18.2° N of the equator. Thus, the climate is tropical. This means that it is hot and humid here, all the time. There are two main seasons, wet and dry. The wet, or rainy season is between June and October and the dry season is from November to April or May. During the rainy season it can and usually does rain every day, albeit the sun comes out quite often. "Summer" here is between March and May, that is when the schools are out and the weather is the hottest. The best time to visit is between November and February — the weather is very pleasant and rain-free days are most likely. That time may be winter in the northern hemisphere but in the Philippines is still warm, even at night. Most Filipinos have never seen snow except in movies and on TV and many dream of experiencing it. The Philippines has a total population of over 95 million people and it is the world's 12th most populous nation. It is crowded here, no question. It is not unusual for a Filipino household to have 20 or more people living in 3- or 4-room house. Many young working people rent "bed spaces" in boarding houses where they sleep 20 or 30 to a room, dormitory style. It is not unusual to have 30 to 50 people in line ahead of you when you go to the bank, to buy movie tickets, or at the grocery checkout counter. OK, back to geography. The Philippines have three main island groups. Luzon is the northern third of the country, Visayas is the middle third and Mindanao is the southern third. All of them have very nice places to see and even to live and all of them have areas I would not recommend. Luzon is the most economically, politically and culturally important island group and it is the home of the capital city of Manila. The National Capital Region is the most crowded, congested and in some ways most polluted area of the Philippines. If you live here as a foreigner, you cannot avoid visiting Manila since that is where all the major government offices as well as foreign embassies are. The smog is as bad or worse than Mexico City and the traffic is horrendous. Baguio is the "summer capital" of the Philippines, north of Manila in the Cordillera Central mountains at an elevation of 1,500 meters (4,920 feet). Its climate is subtropical highland and thus cooler than lower elevations. Luzon is in the middle of the "typhoon belt" and severe typhoons occur frequently. Earthquakes and volcanic eruptions are also frequent. We have been to Manila many times and are not eager to return. We have also visited Puerto Galera at the northern tip of Mindoro Island, Oriental Mindoro Province. Puerto Galera is the playground of the wealthy from Manila, it has many nice resorts but the place is quite remote. 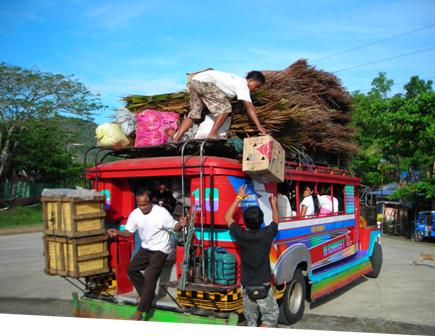 Bus or van service runs from Manila to Batangas at the southern tip of Luzon Island, then a quick boat ride to Puerto Galera. The various resorts in Puerto Galera offer transfer service from Manila directly to the resort. Many resorts include the transfer in the room rate (no extra charge). Visayas is most often frequented by foreign visitors, as it offers some of the most spectacular destinations. Cebu City, the "Queen City of the South" is also referred to as the "southern capital of the Philippines". Cebu City is a vibrant and fast-growing metropolis and vast commercial center. Cebu City has many of the same problems as Manila, albeit to a lesser extent. The island of Cebu has many pleasant towns, such as Bogo and San Remigio in the north, Argao and Oslob to the south, Badian, Moalboal, Barili and Toledo City along the west coast. Long-haul, air-conditioned bus service connects all these cities to Cebu City, the capital of Cebu Province. Visayas is outside of the range of typical typhoons and it is seismically stable. It has no active volcanoes. The most popular tourist destinations are Boracay and Palawan islands in Western Visayas and Bohol in Central Visayas. Boracay is famous for its white sandy beaches (second best beach in the world per TripAdvisor), luxury resorts and hotels but it is pretty remote. There are no supermarkets on Boracay and you have to take a pump boat from Caticlan (36 minute flight from Manila) to reach it. Palawan is the most scenic, cleanest and greenest island of the Philippines and it is its the westernmost major island. Direct daily flights to Puerto Princesa (Palawan's capital) operate from Manila and Cebu. 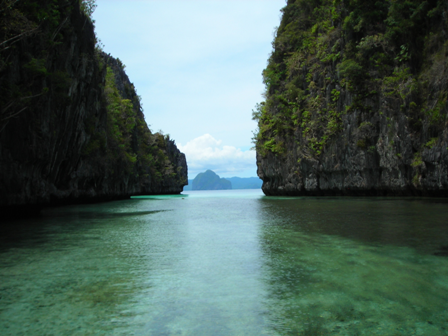 Palawan has fantastic beaches (central and south Palawan) and unparalleled scenery (El Nido area in the north). Purto Princesa is growing very fast. Robinson's is building a huge mall there (the island's second). Other areas of Palawan are remote, difficult to access and have limited services. Of several tourist attractions on Palawan, the Puerto Princesa Underground River is the most noteworthy. It is a candidate to be one of the "New 7 Wonders of Nature" and definitely worth a visit. In the last two years Palawan has been overrun by land speculators, so property values have skyrocketed. Land is more expensive there than in many parts of the US. We originally wanted to settle around Puerto Princesa but got quickly discouraged by the high prices. Bohol is a very popular tourist destination and home to many foreigners. It is my wife's birthplace and she has a large family there so we visit at least every month. The island is located just SE of Cebu, a 2-hour boat ride (SuperCat, Weesam, OceanJet) away. Some of the nicest resorts are on Panglao Island's Alona Beach. Panglao is connected to Bohol by two bridges and is a 15- to 20-minute ride from Tagbilaran. Anda, on the eastern tip of Bohol at the tip of a peninsula, is well worth a visit. Anda is also a popular tourist spot, albeit more remote than Panglao — 100 km north of Tagbilaran. The capital of Bohol Province is Tagbilaran city, which has a domestic airport with daily service to Manila. Tagbilaran boasts two malls, BQ Mall downtown and Island City Mall (ICM) a bit farther out. ICM is the bigger and nicer mall. Tagbilaran's big drawback is its incredible traffic congestion. Unlike in Cebu City, motorized tricycles are permitted in Tagbilaran and they clog up the highway and streets to such extent that getting around is difficult. Property values on Bohol have also risen substantially over the past couple of years, but it is still a very desirable place to live. The island's attractions (Chocolate Hills, Tarsier Compound, Alona Beach) keep drawing tourists from far away places. Bohol is near enough to Cebu City as to make a day trip to Cebu possible — for shopping and services one cannot find on Bohol. Other nearby islands well worth a visit are Camiguin, Siquijor, and the Camotes Islands. Camiguin, albeit small, it is a wonder to behold. Located SSE of Bohol and just N Mindanao, it is off the beaten trail. Ardent Hot Springs is a national treasure and quite undiscovered. Several hot and warm pools (heated by the island's volcano) offer a relaxing experience. The entrance fee for a day is 30 pesos. Boats from Jagna, Bohol and Cagayan de Oro, Mindanao service the island. Siquijor is also small (the smallest of the Philippines' provinces) but quite picturesque. Siquijor is famous for its "faith healers" — just don't call them "witches"! The Camotes Islands is two small islands (Pancuan and Camotes) connected by a bridge, plus a third small island (Poro) nearby. Camotes is located E of Cebu and N of Bohol, also a 2-hour boat ride from Cebu City. Camotes are very remote, there are no services to speak of but two very nice resorts. Santiago Bay is the nicest. We have not traveled in Mindanao. The US Embassy in Manila discourages Americans from visiting, however the norther part of the island is quite safe. The southernmost part is the Autonomous Region of Muslim Mindanao (ARMM). It is definitely not a good idea to travel there unless you are among the most adventurous. What is the "best" place to live in the Philippines for an American? It depends on a myriad very personal and individual factors. Is proximity to western class services, such as medical care a priority? Congested cities offer many conveniences but they tend to be dusty, dirty, polluted and very noisy. Rural areas are not well supplied, most staples are bought and sold in "public markets" or "wet markets". If you have to have your Frosted Flakes, they might be hard to find. For us, we wanted to be fairly close to a city but not in it so we have access to services but don't have to endure its drawbacks. We bought a townhouse in a guarded subdivision in Talisay, a short walking distance from Gaisano Grand Fiesta Mall in Tabunok. Our property is far enough from the main road so there is no noise or dust, up on a hill so there is always some breeze off the sea, near enough to the beach. Talisay is 8 km from Cebu City and there is a fast road (South Road Properties, or SRP) that makes it easy to get to the port and even the airport. We move in at the end of September. I will likely write a post about the experience of building and buying a house. We just launch our Filipino American and global Filipinos portal i just read how you feel as an american retired in the Philippines i would like to invite you as one of the contributor for www.philfortune.com can you provide your contact number i will be in Cebu this Feb 2012. Hi, thx for the info. Want to retire. Im 41 yrs old, i left olongapo at 12 yrs old. Where is a nice place thats affordable to live on the beach? I like to surf n SUP. Thank you for your comment. Where to retire is a personal choice and many factors come into play. I definitely suggest Visayas (middle of the country), especially in light of the recent flooding. For people who like to surf tho, Visayas is not the best choice -- too protected. The best surfing in the Philippines is around Siargao Island in Surigao del Norte (Lat 9.878893 N, Lon 126.107941 E). Since there is no land mass to the east, it is quite exposed to typhoons. A preferred compromise is Bohol but it has gotten well discovered and the prices begin to reflect it. It is quite expensive on Panglao Island and getting so on the Anda peninsula (100 km N of Tagbilaran). The west side of the island (Loon to Tubigon) is not as pricey but it faces the Bohol Strait and Cebu (no open sea). I'm a 22 year old student that plans on moving to the Philippines to study next year. Which area would be the best to live in, with good universitys, security, hospitals, apartment (pad)? I will have help from my family, they will be supporting me all the way from usa. Hi Anton! Thanks for writing. You pose a difficult question, especially since you did not give any details about your major. For a young man attending a university, the largest cities are the best choice. For my own son, I would recommend Cebu, the Queen City of the South, for several reasons. There are many fine universities and Cebu is also a high-tech hub (Asia IT Park). At the same time, there are many opportunities for recreation in Cebu, some of them quite civilized. I am one American that loves Manila!!! Sure, there are a number of things not so good about it. But there is so much fun to be had in the Manila area. I prefer the Makati, Glorietta, Rockwell, and Landmark areas...but there are many more. The city NEVER sleeps. Manila is either loved or hated the same as New York City is mostly either loved or hated. I lived in Mindanao and loved it...although the area did get a bit boring. Mindanao, most of it, is very safe. The far south can be a bit salty for foreigners. Iloilo is a very good place, and I really liked Legaspie. Cebu City is a place I could easily live in. Remember, Manila is not actually the biggest city in the Philippines. I believe it is Quezon. People confuse Manila with METRO Manila. Metro Manila is a group of I think about 17 different cities. There are many nice places near Manila and Manila is a place EVERYONE should explore. Just be prepared for a lot of traffic and crazy taxi cab drivers. I LOVE IT! Great post! I am heading to the Philippines for the first time and I am torn on where to stay for the majority of the trip. Talisay, 8 km from Cebu City, sounds good. How far is this from the beach? I am in Angeles City and I miss the ocean. Also, how much are furnished apartment rentals there? Hi Anon, There is a beach nearby ("Barangay Dumlog" see Google maps, about 5 minutes) but it isn't a very nice one. Further south (Argao, etc.) you will find some spectacular beaches. The best nearby beach is in Bohol Province, on the island of Panglao, called Alona Beach. Tagbilaran, Bohol is a 2-hour ferry ride from Cebu Pier 1. Hi CH, Angeles City area is not quiet or clean (no place in the PI really is) but many expats find it livable. Travel around Visayas and see what you like. I recommend the islands of Bohol and Cebu. You can live comfortably on $1,000, not lavishly but well. You'll have to find your own balance between the well-supplied, well-serviced but crowded (e.g. : Cebu City) and the remote but quieter places (e.g. : Anda, Bohol). Good luck! Hey great blog. Planning my move to the Phils later this year. Question, can I show up there and buy a motorcycle? Do I need a license or any other paperwork? New vs used? I need some wheels and I'd rather not rent. Thanks keep up the good work! Cebu is perfectly safe if you use common sense. Leave your Rolex and gold chains at home, dress casually (shorts and T-shirt), carry little cash and you'll be fine. From the airport, do not take the yellow cabs but walk across the way as you exit and take a flight of stair up, you will find the regular white cabs waiting.